This work, Lung Cancer, Volume 2: Diagnostic and Therapeutic Methods and Reviews, in the Methods in Molecular Medicine series presents an overview of the current status of those methods useful in the diagnosis and tre- ment of lung cancer-both as it exists in the clinic and as it is being revoluti- ized in the laboratory. 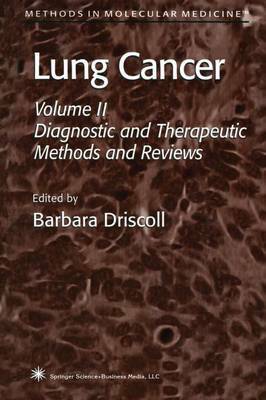 The book is intended to serve as a resource for researchers wishing to increase their knowledge of current and cutting edge technologies, in order that their investigations into neoplasms of the lung may benefit from this enriched diversity of techniques and approaches. Owing to the complex nature of the disease and the variety of methods available to analyze and attack it, no volume attempting to define diagnostic and therapeutic approaches to lung cancer can ever be complete. The sheer number of investigators involved in lung cancer research guarantees that some aspect will be inadvertently excluded. However, I hope that the range of techniques included herein will serve to open up new avenues of investigation for both the novice and experienced researcher.